The So-Phis Fashion Show is a fun event that raises money for worthy charities. ANAHEIM — So-Phis of Orange County, a social and philanthropic organization will host its 58th annual Fashion Show, Luncheon and Boutique on Saturday, April 23, at the Anaheim Hilton and Towers, located at 777 Convention Way next to the Convention Center. Guest emcee will be David Ono, Emmy Award and Edward R. Murrow Award winner and co-anchor for ABC7 Eyewitness News at 4 and 6 p.m. He will be joined by co-emcee Denise Dador, Emmy Award winner and Eyewitness News health specialist, who is seen on the 4 and 5 p.m. newscasts. This year’s theme, “Hope, Dream, Inspire . . . Sustaining for Future Generation,” will again present a collection of fashions for spring by designers Jazzmin, Citron, Renko, and Yearsly and young girls’ designer Lularoe. Jewelry by Sky Diamonds will also be featured in this year’s show. 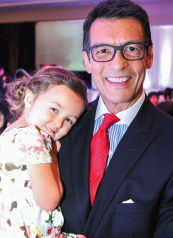 David Ono, pictured with daughter Kaia, will serve as emcee. A unique and well-attended boutique, which will include items from fashion show designers, is open to the public starting at 9:30 a.m. Dining room doors open at 11:30 a.m., with lunch served at 12 noon. Contemporary entertainment will be provided by Makoto Taiko, MCIA Dance Team from UC Irvine, and singer Joanne Baduria. So-Phis has dedicated 58 years to improving the quality of life for communities throughout Southern California. Proceeds from previous fundraisers went to support A3M (Asians for Miracle Marrow Matches), CHOC (Children’s Hospital of Orange County) Therapy Dog Program, JACCC (Japanese American Cultural and Community Center), Pediatric Cancer Walk, VFW Memorial Program, Walk to End Alzheimer’s, Japanese American National Museum, and more. So-Phis event co-chairs Cynthia Tani and Elaine Ganiko extend an open invitation to everyone. Ticket cost is $70 and includes validated parking. For ticket information, email [email protected] Tickets may also be purchased at the door on the day of the event.